Essentially this book is nothing more than a list of online podcasts with a brief description of the podcast contents. If you don’t know how to use a search engine then maybe this book is for you, you can read it under the Moonlight in the cave you live in while you feast on Dodo eggs and bat droppings :D. If you do know how to use a search engine, do so, and the results will be more up to date and relevant to what you want. Do save your money, do save your time, do save some trees, do use a search engine, don’t bother with this book. You can get a free podcast hosting service from PodOmatic. And here’s a great free audio editing software program called Audacity. I learned more in the first 30 minutes of the podcasting element of the Digital Media course than I learned from this book. 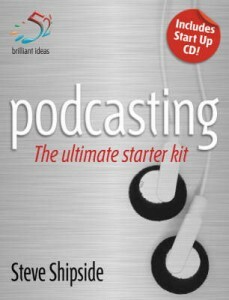 This entry was posted in Books, Reviews and tagged audacity, book, book review, podcast, Podcasting - The Ultimate Starter Kit, PodOmatic, review. Bookmark the permalink.